In this day and age, fewer families are spending time out-of-doors in their natural environments. Given this unfortunate trend, options have diminished, too that are accessible and affordable. Under the leadership of the accomplished husband and wife team of Andy Bicking and Jenny Lee Fowler however, some of that is about to change in our area. 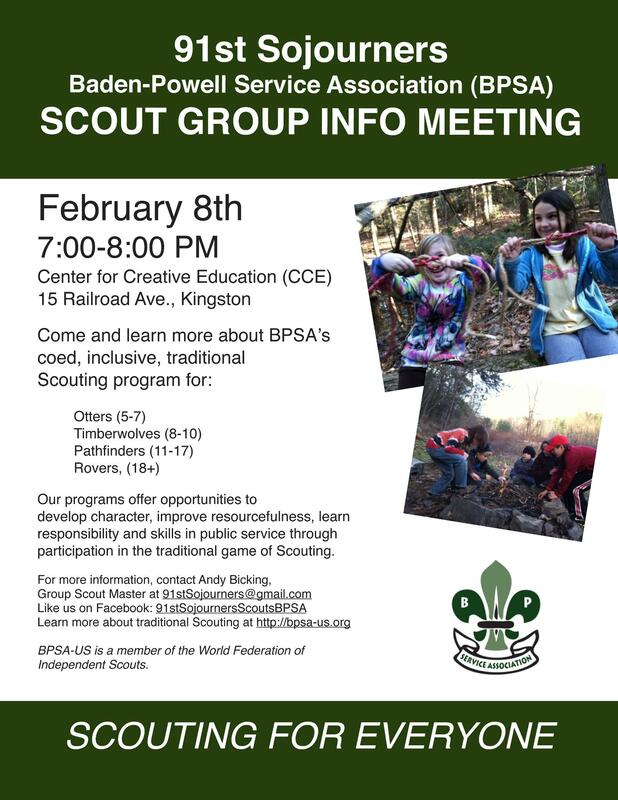 An informational meeting is scheduled for February 8th from 7:00pm – 8:00pm at the Center for Creative Education in Kingston, NY. KingstonCitizens.org: Can you share your history with the Boy Scouts of America organization? What inspired you to create the 91st Sojourners Scout Group? Andy Bicking: My family has a 5 generation history with scouting programs that began in the early 1900s. The skills and values that I learned as an Eagle Scout are important to me and ones we’ve worked to pass on to our children and the kids in our lives. My wife, Jenny Lee Fowler, and I learned about the Baden-Powell Service Association (BPSA) this summer when searching for scouting programs with inclusive membership policies. BPSA was more than we had hoped for. It focuses on developing proficiency in traditional outdoor skills (in the spirit of pioneers and explorers) and serving your community. Anyone can join – youth or adult, boys or girls, and you can do it as a family. BPSA is a national organization and part of the World Federation of Independent Scouts (active in over 40 countries). We’re creating the first BPSA group in the Hudson Valley, the 91st Sojourners. “91st” is for Hudson River Mile 91, our mile mark on the river. “Sojourners” honors of Sojourner Truth. Born in Ulster County, she overcame many challenges in her life and brought her message of freedom and equality to the world. KC.org: Can you describe how you are organizing age groups, and how do you intend to organize them? Our programs offer opportunities to develop character, improve resourcefulness, learn responsibility through serving our community and participating in the traditional game of scouting. Kids are organized in small groups and learn by doing, usually in the outdoors. For example, younger scouts take short hikes, learn to tie basic knots and may care for garden planters in public spaces. Older scouts camp overnight in the Catskills, learn wilderness first aid, craft pioneer-style structures, and may help build trails in our community. Each age section has two adult volunteers who provide guidance appropriate to ages and skill levels, and mentor kids in the leadership of the program. As scouts mature they move from observing skills in action to doing them and teaching them on their own. KC.org: Are there any associated costs with becoming involved? AB: The membership fee is $20 a year. Since BPSA is a volunteer organization, costs and overhead are very low. The group is responsible for earning funds to pay for its own program. We’ll be using our traditional scouting skills to raise funds to support the group’s activities. KC.org: You have an informational meeting scheduled on February 8th. What do you expect to cover that evening? AB: There’ll be an overview of the BPSA program and information about future activities. You can meet the volunteer leaders, ask questions, and find out how you can get involved and support the group. We’ll have registration packets available at the meeting for all who want to join. Although KC.org retired years ago, we periodically like to bring something to your attention as you have seen here and on our Facebook page. We hope you enjoy them when we do.